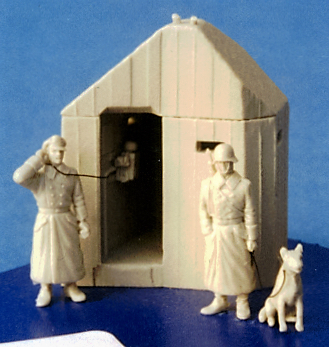 A 1/76th scale Fortress concrete sentry box with an Officer figure plus a guard figure with dog. The sentry box has an interior with fortress telephone. This type of box was used at the entrances to fortified areas such as infantry strongpoints and gun batteries etc. There are no reviews on this product. You should add one. Moncrieff House, 69 West Nile St, Glasgow, United Kingdom G1 2QB, Registered in Scotland.